Justin Bieber is used to attracting crowds. But he had at least one follower too many when somebody tailed him on a Los Angeles freeway, and it led to a speeding ticket for the teen idol. The singer of "Boyfriend" and "Baby" was cited for driving in excess of 65 mph at about 10:45 a.m. Friday, after calls came in complaining of a freeway chase on southbound U.S. Highway 101 near Studio City, said Officer Ming Hsu of the California Highway Patrol. The 18-year-old crooner told officers he was being chased by paparazzi, and investigators confirmed he was being followed by at least one vehicle, Hsu said. "The second vehicle left the area and there's a search to find that driver," Hsu said. Hsu did not have a description of the other vehicle. A call and an email to Bieber's publicist weren't immediately returned. The claim of a chase is backed by an unlikely eyewitness, Los Angeles City Councilman Dennis Zine, who called authorities after seeing Bieber's distinctive chrome Fisker Karma being chased by five or six other cars. On his morning commute to City Hall, Zine, who spent 33 years as a police officer, said he saw Bieber's sports car drive up behind him and zoom around him, weaving wildly in and out of traffic while five or six other cars gave chase. Zine estimated the chase exceeded 100 mph as paparazzi engaged in wild maneuvers to keep up with Bieber, including driving on the shoulder and cutting off other vehicles. Zine said Bieber was breaking the law by driving recklessly and speeding, and the paparazzi were breaking the law by hounding him. "This was very bizarre, very outrageous and showed a total disregard for life and property," Zine said. Zine, a witness to countless crashes and fatalities during his time as an officer, said he was surprised no one crashed. 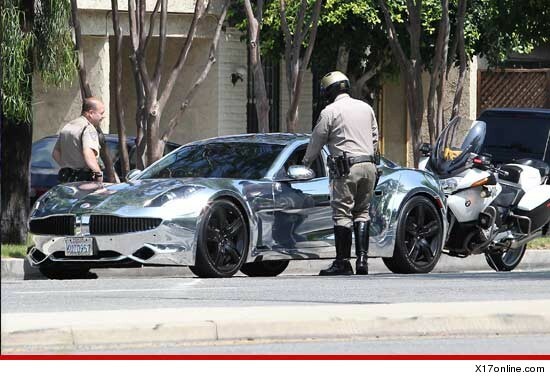 "The way (Bieber) was driving was totally reckless, I would have arrested him if I had pulled him over," said Zine. "I wouldn't have given him a ticket and let him go." Friday's incident isn't the only time the floppy-haired singer has had conflict with paparazzi. In May, a photographer called authorities, complaining he was roughed up by the pop star in a shopping center, The Commons at Calabasas. Authorities said the scuffle happened when a photographer tried to snap photos of Bieber and his girlfriend, teen actress Selena Gomez. In April 2011, Bieber called off a meeting with the Israeli Prime Minister Benjamin Netanyahu in Jerusalem, saying he cancelled, in part, because he didn't want to face the country's notoriously aggressive paparazzi.